I am so annoyed. Without knowing my sump pump went out and we had a HUGE downpour yesterday. So, on my way down to the basement stair landing (this is where I keep the tank of crickets for the lizard) I could smell mildew. I didn’t think much of it but thought that was really odd and told my husband. He did not seem alarmed at all so I shrugged it off. No biggie. Well…. I went to the basement ans took one step on the carpet and enough water squished out of it to cover my toes. THE ENTIRE BASEMENT FLOODED! So my workout area is saturated, we lost about 100 books or more and thank goodness there was a moisture barrier under the new wood floors so those are okay. So this means I lost my workout area for now. We have tons of fans going so we can dry it out and need to get a dehumidifier down there. Of course this happens when I just get back to my workouts, so for now I have lost my workout area and will have to spend quite a bit of time getting the basement cleaned up. It’s all good though. Temporary set back. Just terrible annoying! And with all of those fans going I can smell the mildew creeping up to the first floor. YUCK! Posted in Health and Fitness, Life, Uncategorized and tagged basement flood, minor annoyance, set back, workout area. Bookmark the permalink. 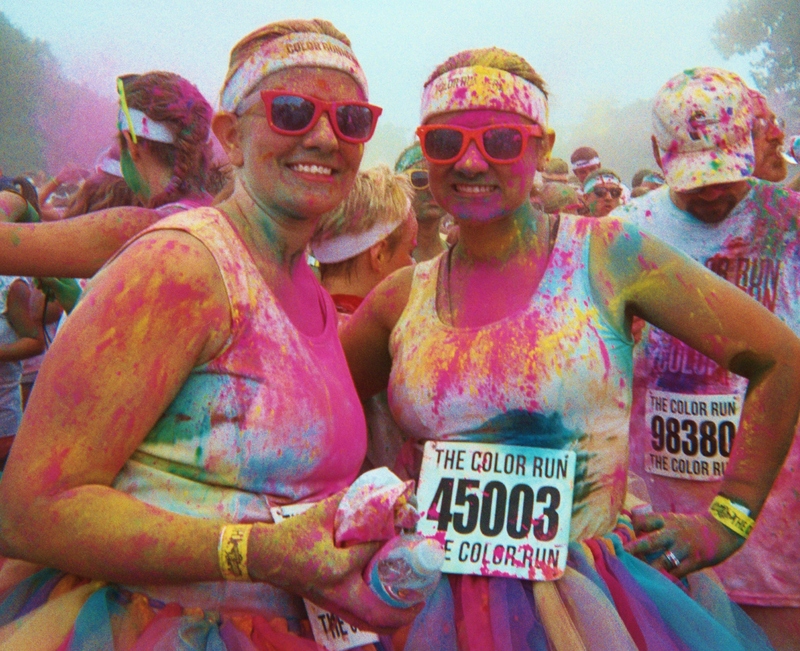 They call it The Happiest 5K on the planet. I would like to say they yes, in fact it is. 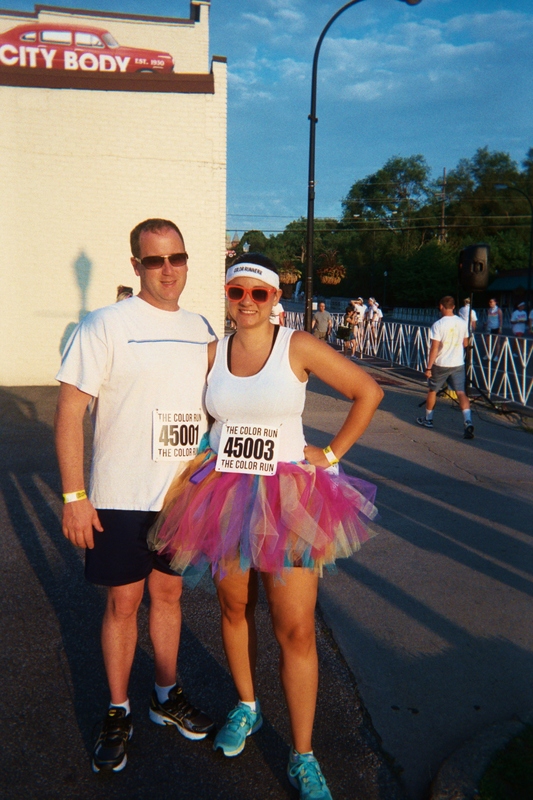 Granted it is not a balls-to-the-wall run your heart out 5K but a frolic and skip kind of 5K. 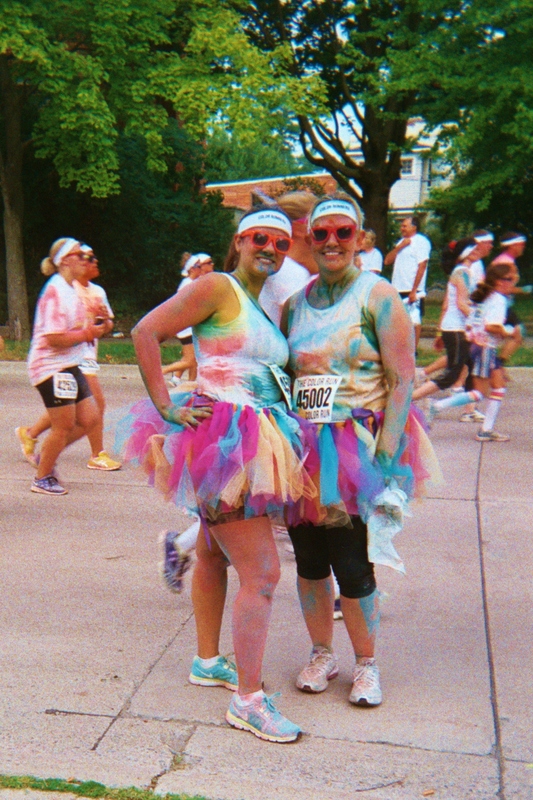 As my regular reads know I came across The Color Run quite some time ago and decided that would be my first 5K and that I was determined to rock it. I had no idea that it would be so laid back, that in turn was a good thing because I bummed my knee and couldn’t do much running come race day. I ran, walked, skipped and rolled around on the ground and left dirtier than I ever had been in my entire 31 (not so long) years on this planet. The experience was one of a kind and I felt like a little kid, with the stupid grin on my face and all. What is the appeal? Honestly, for me, it looked fun. why I don’t know. 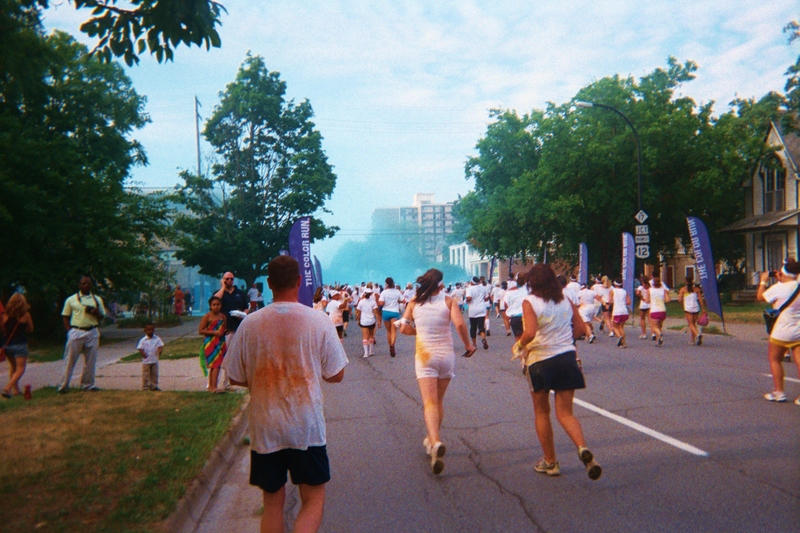 People were confused that I would pay to get doused in colored cornstarch and pay to run. I liked the whole whimsy of it, the fact that I never let go and get too dirty. Except in the garden, but that is different and less like prancing through a rainbow. 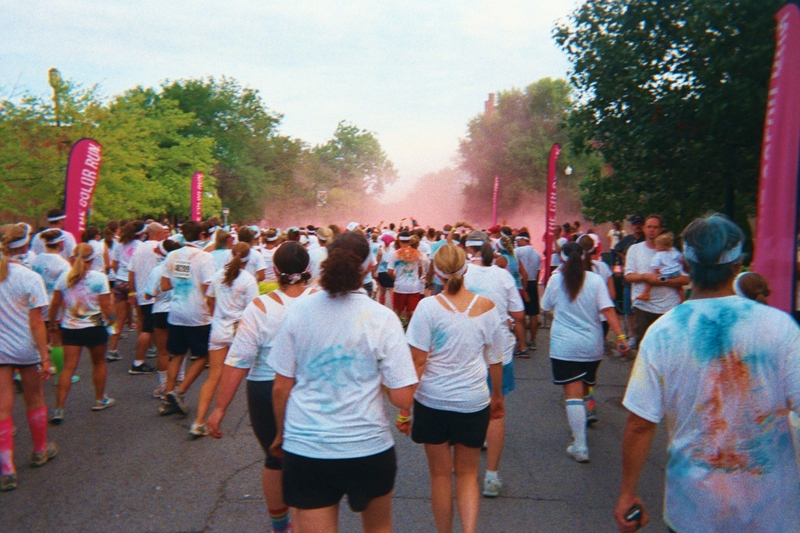 All that I know is that it was a blast and they announced The Color Run is to be held again in Ypsi next July so I am there! 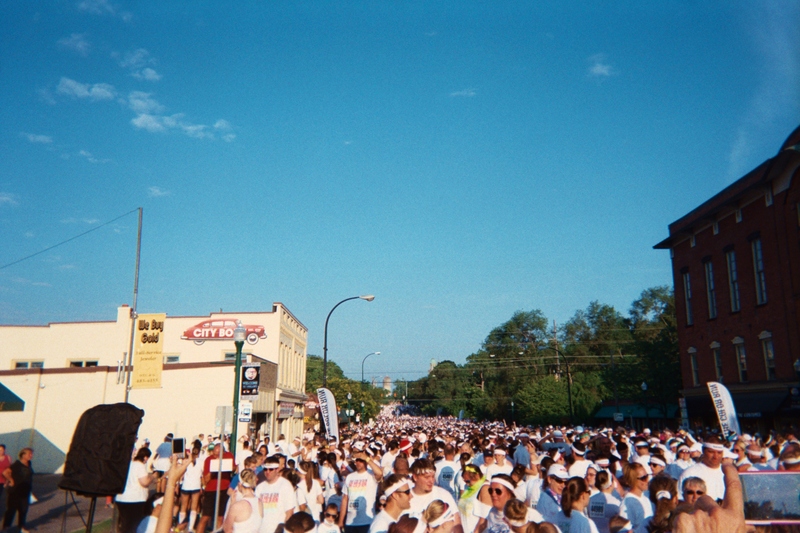 The premise of The Color Run is to show up in white and get doused with color at each checkpoint. Then after they have a gathering of 15,000 of your closest friends where they play music, have contests and everyone throws their color packets in the air all at once. 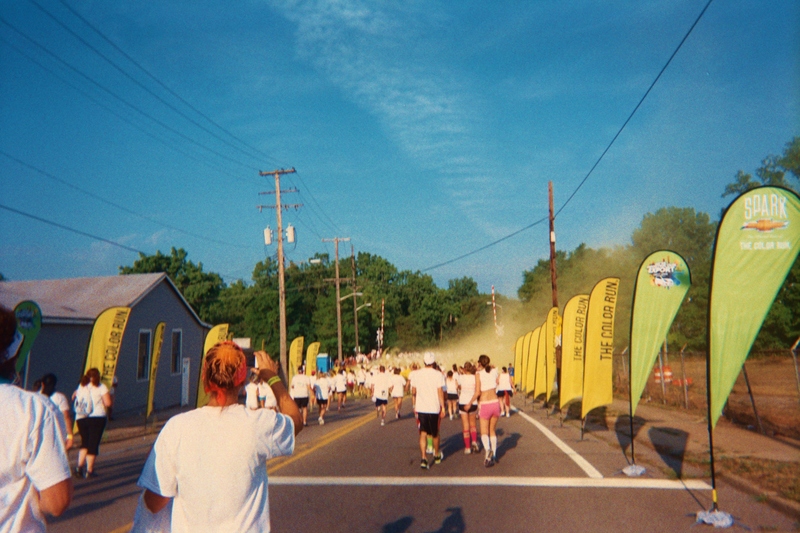 All in all Ypsilanti, MI did a great job hosting the run, even with the short notice that was given. 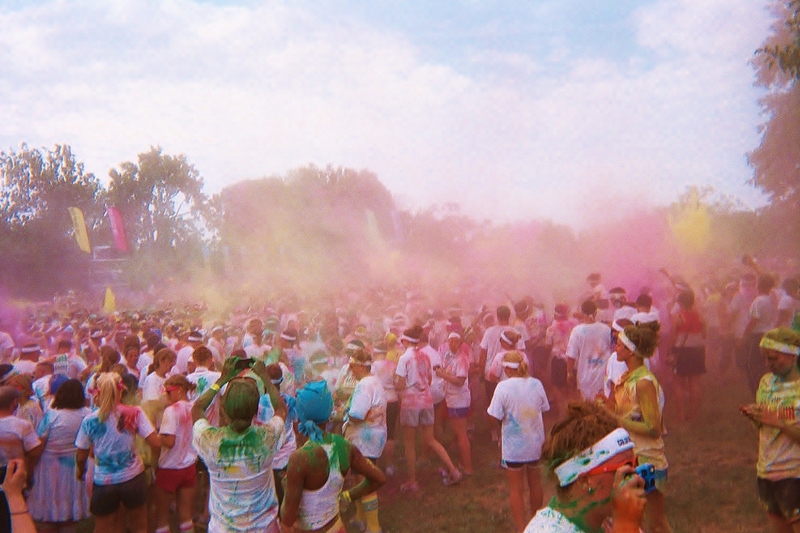 The Color Run was originally supposed to be held in Ann Arbor, MI but for some reason it was moved. I heard that it was a permit issue as well as the fact that is the weekend of Ann Arbor’s Art Fair. Either way they did a bang up job and kudos to Ypsi! Sarah and I are all clean and ready to go! We were in the first wave of runners but pretty far back. The cutest little volunteer 🙂 He did a great job getting us all! I wish I would of gotten his name so I can credit him in the pic. The aftermath of the Blue Zone. Us at the finish line! 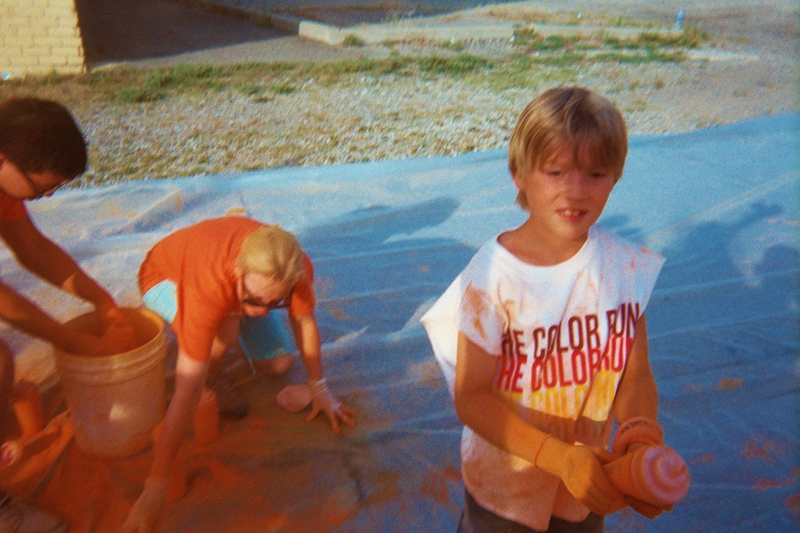 After the Color Party. 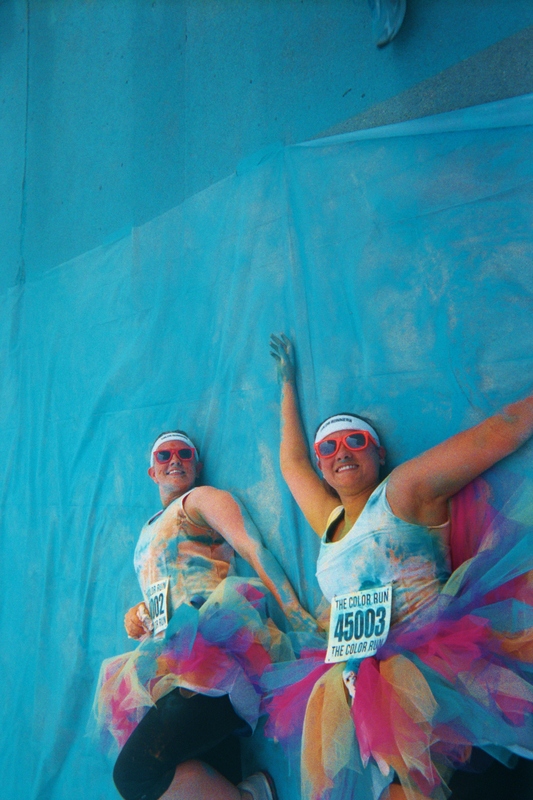 We look like a Unicorn Pooped on us! 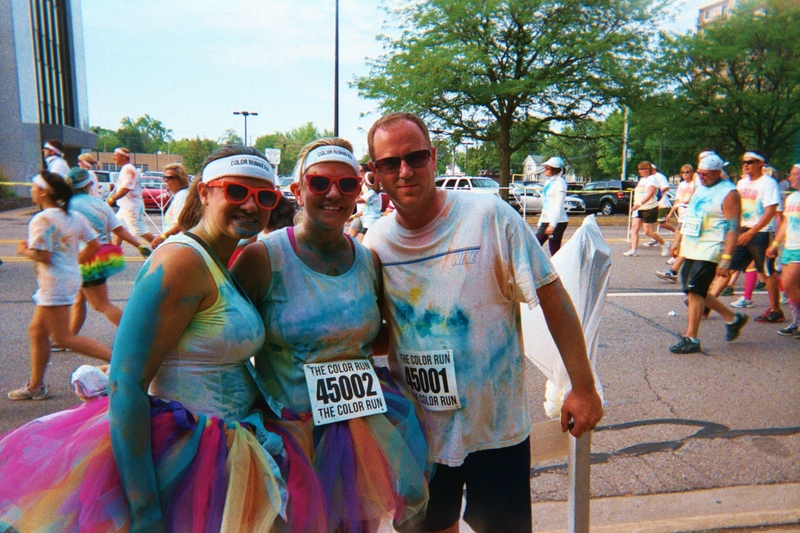 Posted in Health and Fitness, Running, Uncategorized and tagged 5k, fun, running, The Color Run, Ypsilanti MI. Bookmark the permalink. More often than not the terms fat people, obese, and fun things like that. 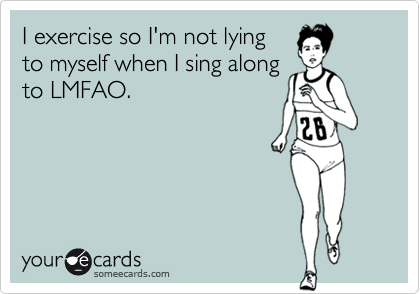 So to answer that question, yes, fat people like me should do Les Mills, as well as skinny and average people. No one gets thinner, fitter or improves themselves by doing nothing. We all have to start somewhere. Les Mills or whatever venture you choose. 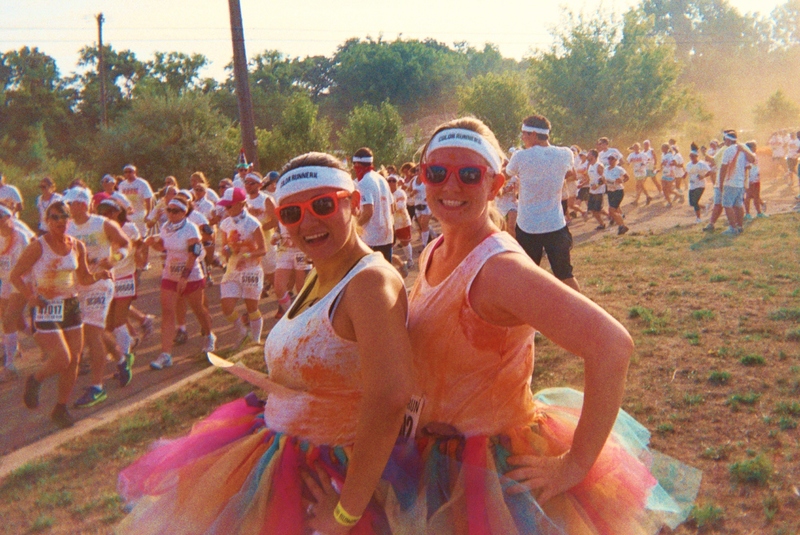 I got my disk of Color Run Photos, I am going through them tonight and figuring what ones are usable. apparently cameras with view finders confuse people and there are lots of “half” shots. Look forward to seeing them tomorrow! I assume if it has to have been Googled before to show up. Am I right? 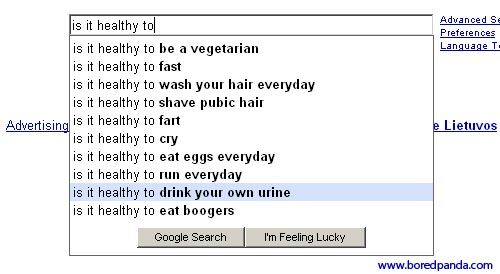 Posted in Blogging, Health and Fitness, Humor, Life, Uncategorized and tagged fat, funny, google. Bookmark the permalink. It has been too long since good workouts have been a regular part of my daily life. Even though it was due to my bum knee I feel like a lazy bum. The past two days it has been feeling like it is back to normal so I am ready to get started again. It is about time! I have put on a pound this week and that really is getting on my nerves. I have not gained inches in the areas that I measure but I know I have in places that I don’t, this is unacceptable. Now that getting back on track is possible I am starting today. Where to start is my main question. Round One or Round Two? With it being weeks since working out full force has happened I am thinking Round One but doing the Les Mills Pump ULT cardio workouts on the cardio days and doing yoga on rest days. I seem to recuperate better with yoga, it is relaxing and helps with my aches so it counts as rest in my book. So here I am back to the drawing board at day one. Getting back is exciting but starting over is mildly discouraging. One step at a time though, no need to do something and end up with another bum knee because I decided to go balls to the wall with it. So here I am Day One of Ninety! Wish me luck! 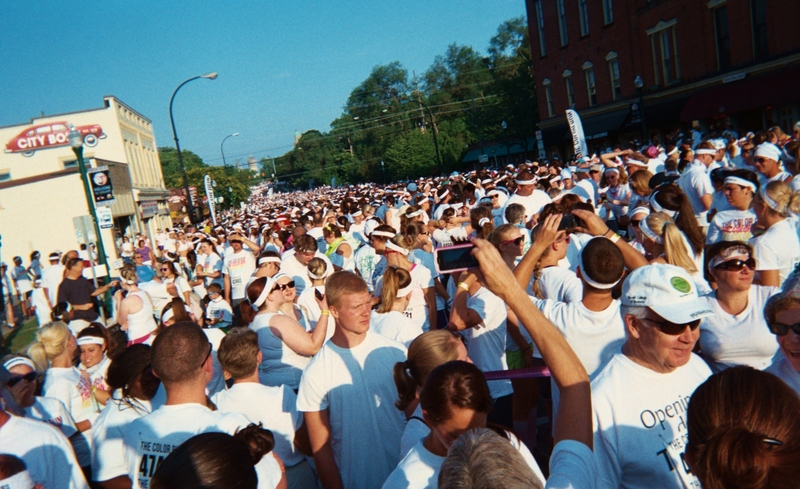 I should get my Color Run pics from the photo shop today. Can’t wait! Oh and we can not forget my weigh and measure in. Here you go! Posted in BeachBody, Health and Fitness, Les Mills Pump, Life, Uncategorized, Well-being and tagged bum knee, cardio workouts, Color Run, exercise, health, healthy-living, inches, les mills pump, Starting over, weigh in, weight gain, Workout, Yoga. Bookmark the permalink. What an awesome post. Every word is so true. Sometimes as a parent it is nice to realize that we are all the same, have the same joys and the same frustrations. Thanks for this post! *I’ve learned to let go. I don’t think of myself as a tightly wound individual, but certain things have made me so. I first noticed it when I was pregnant with Claire. The thought of sharing her with the world made me both sad and angry, and I had no idea why. I carried that into the first few months of her life where I literally never put her down. Sometimes I wonder where my kid comes up with the stuff that comes out of her mouth. Some things embarrassing, some hilarious and some down right disturbing. I love that kids have no filter (sometimes). For those of you on my personal Facebook page you already saw today’s interesting kid story. So sorry for the repetition. E: Mom!! Tico is eating all the baby bunnies!! When I got over to the rabbit hole there was nothing but blood and fur left and Tico was licking his chops. Me: No Tico, quit killing the baby bunnies!! E: He can’t help it, he has to protect the cabbage in the garden. Me: Sorry you saw that Emma. E: You know dogs are carnivores right? Moral of the story is I do not have a squeamish little girl. She wants to go hunting with her dad one day, loves bugs, knows where her meat comes from and has no problem with that. I never saw the point in lying when she asked me so many years ago. I am glad she understands and respects the god old Circle of Life. LOL! Posted in Family, Humor, Life, Uncategorized and tagged children, dogs, funny, pets, rabbits, things that kids say. Bookmark the permalink. Life is great and so are you! Today there is definitely some sown time so it is time for me to follow through accepting some lovely awards from fellow bloggers. With summer comes a plethora of fun and exciting activities, vacations, weddings, yard work and other busy work to do. This being said I have gotten behind on my blogging. With all the inconsistent posting here I am very glad so many of you have stuck with me and have kept reading. you all are the best! And let’s not get started on how I haven’t been able to read your blogs as much as I would like to this summer. Starting this blog was more of a selfish thing. I needed a way to keep track of my get fit and healthy journey. Also a way to be kept accountable was needed. Falling off the wagon is to easy when you feel that there is no one watching in the first place. So thank you readers for helping to keep me on track, motivated as well as supported. It is wonderful that I have found so many people who are so much like myself and working toward the same goals. It is like Weight Watchers meetings without counting points or paying fees. 🙂 After so many months of being here my motives have changed a bit. Getting messages/comments about how I can inspire, support and motivate others to get fit and be at their best has been more than flattering. Hearing about how others enjoy reading my random ramblings is amazing. Honestly I can say that recently I have been falling off track. Workouts have suffered due to vacation and my knee, food I did well at until I got lazy last week. It has not been terrible really but not as clean as it should be. So that do-over that was blogged about is definitely going to happen. And very soon. So watch out world (and interwebs)! You won’t even know what hit you. Over the past few weeks I have been nominated for the One Lovely Blog Award as well as The Very Inspiring Blogger award by Your Truth Diet and Girl of the Hour. Be sure to click their link and check out their amazing blogs. These women rock! Display the award logo somewhere on the blog. Link back to the blog of the person who nominated you. Nominate 15 other bloggers for the award and provide links to their blogs. 2. Link who nominated me: Ditto! 1. I hate getting dressed for the most part and would wear PJs all day if I could. But I think wearing PJs in public is a crime against fashion and nature. Don’t do it. I will mock you. 2. Speaking of getting dressed when I do get dressed I prefer to wear dresses. One of my favorite things about losing weight is that I can wear more dresses, in the summer they are cooler than anything else and more flattering than shorts (for me). 3. I love sushi and sashimi and can eat it daily, maybe even for three meals a day. So yummy! 4. My daughter is the girliest tomboy ever. Girl clothes, make up and perfume but no girlie toys minus Hello Kitty and Monster High. Everything else is dinosaurs, dragons, pirates, ninjas, baseball and video games. She also loves hunting for frogs, toads and bugs and loves snakes and lizards. I am glad I get to frilly pretty clothes and bows but am glad she is not afraid to get out there and get dirty. And honestly, I don’t know if i would want to sit and play Barbie for the next 6 years on a daily basis. 5. Sally my bearded dragon is giving me the evil eye right now because she wants me to get her more lizard salad instead of blogging. I love lizards. 6. I love beer and wine, even when clean eating at full force I can not give up my occasional glass of beer or wine (sometimes the entire bottle). Just.Can’t.Do.It. 7. It is really nice to have friends who are cleaning up their diets and working out more. It has made going out to dinners and socializing much easier. When you can agree on a place that is no longer all burgers, fries and heavy foods it is really nice. having to be the odd man out and order like a crazy person just to get a mediocre meal sucked. it really made me feel like I was putting everyone off, including the staff at the restaurant. 4. Nominate 15 other blogs: Wow, this is a tough one, I love so many bloggers. Posted in Blogging, Health and Fitness, Life, lifestyle, Uncategorized, Well-being and tagged awards, blog, blogging, fitness, life, One lovely blog award, support, thoughts, very inspirational blogger award. Bookmark the permalink. 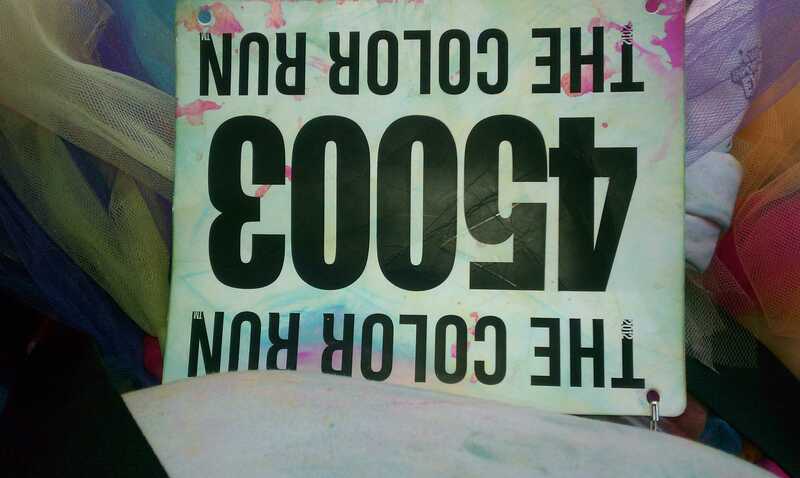 Preview – The Color Run! Thanks for the photo help Enter Fitness! 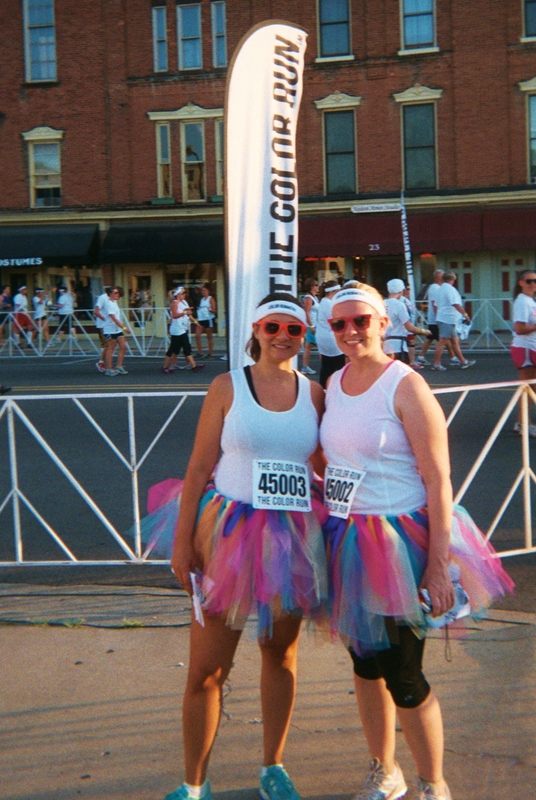 Posted in Health and Fitness, lifestyle, Running, Uncategorized and tagged 5k, bib, running, The Color Run, Ypsilanti. Bookmark the permalink. No workout for me today. If am having fun doing laundry and getting prepped for the weekend. Heading out-of-town for the night, I have to pick up our race day packets so we used it as an excuse to spend the night in Ann Arbor. I think dinner at Pacific Rim may be in order, and cocktails, Mm-mm drinks. I will get plenty of walking in down there so I won’t feel bad about not walking at home today. The weather is kind of strange today (as well as yesterday) so I had to figure out how to dress and not have to change in the evening. 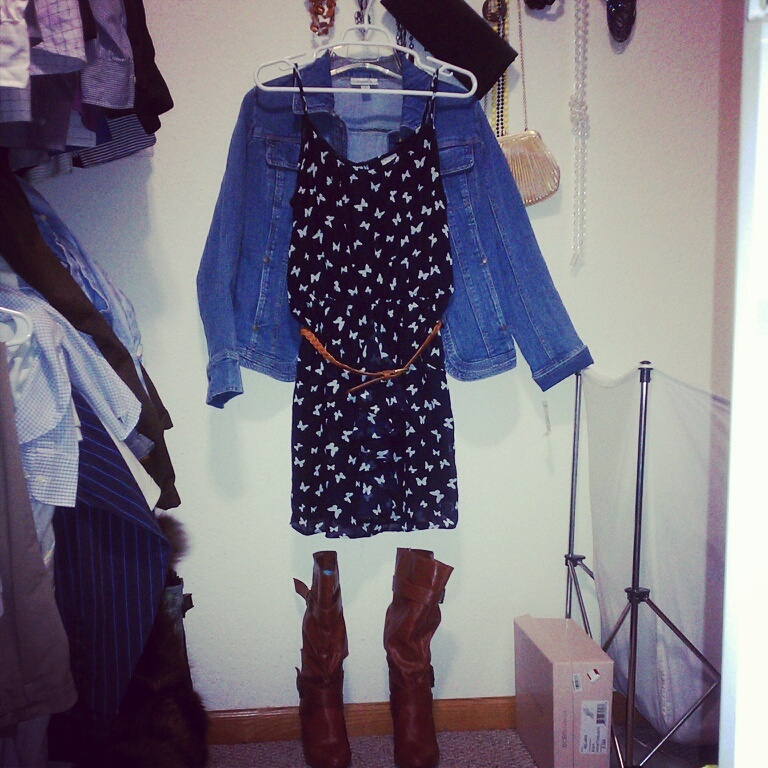 So I am thinking a light dress, belt, tall boots and a jean jacket. That way I can just add or remove the jacket as it gets chilly tonight. The low is in the 60’s brr but is in the 80’s right now. The upper 90’s suits me better, even with the humidity. Cold turns me into a big baby. Why am I in Michigan? Outfit for tonight, Just bought this dress yesterday, tried on the Large and had to ask for a Medium!! Even the sales girls were shocked. They were used to me going in for XL and L earlier this year. Saturday I will return home and have Schmitty’s wedding reception. Can’t wait! 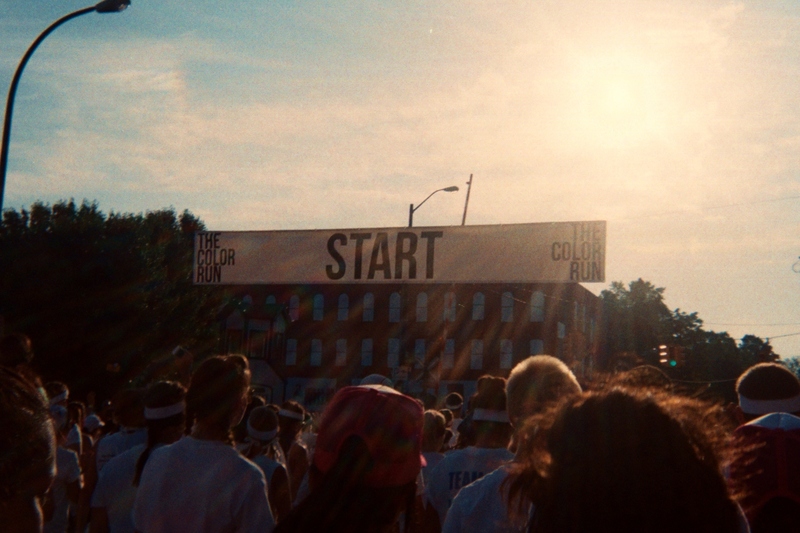 Get to bed at a semi decent hour then head back out-of-town before the sun rises for The Color Run. 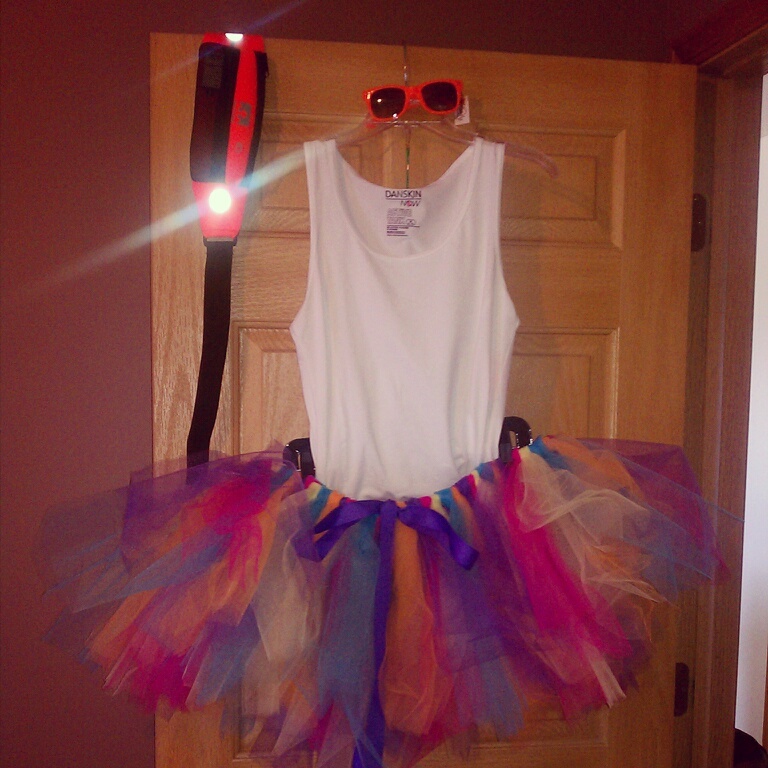 I have my race day outfit prepared and ready to go! I am sure that even though I will not be running that it will be a ton of fun and I will get to spend time with a friend I do not see often. 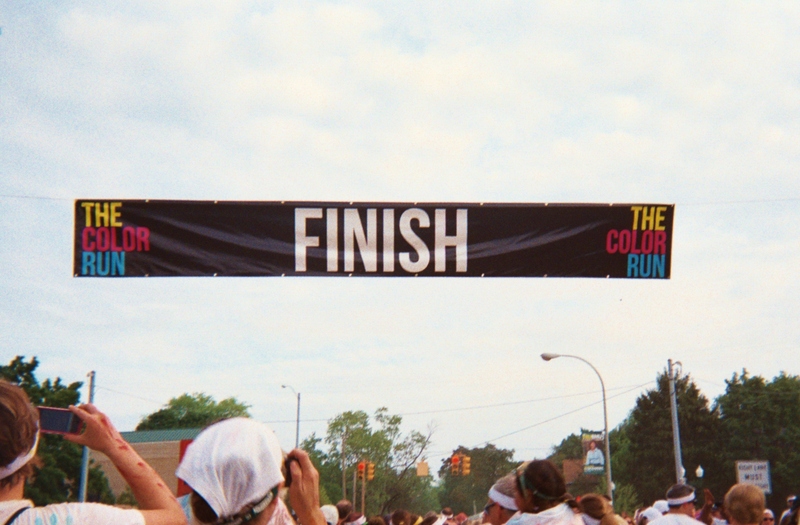 Everything is ready for The Color Run, Ann Arbor! The knee is feeling even better today, the stairs at home are easier to climb and that is a good sign. I am itching to get back to my workouts. I am not looking forward to seeing where this hiatus has left my fitness level. Getting back to where I was shouldn’t be too much of a problem or take long , well lets hope so. After the weekend I have 2 nominations/awards to blog about. Vacay, injury and laziness has kept me from keeping up with my blogging duties. :p I have not forgotten and will get it done! Promise! I hope you all have a fantastic weekend! Happy Friday! 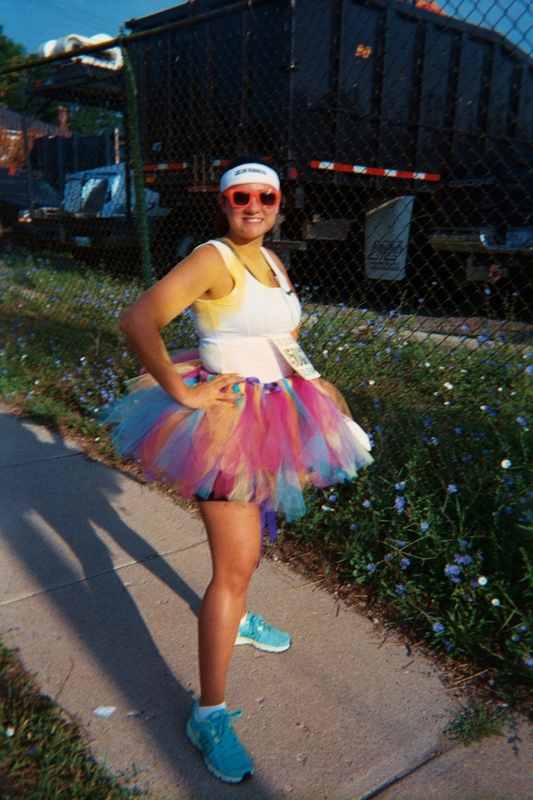 Posted in Health and Fitness, Life, Uncategorized and tagged 5k, blogging, clothing, knee pain, running, running tutu, shopping, style, The Color Run Ann Arbor, weekend. Bookmark the permalink. And for your viewing pleasure here are some pictures from our trip to Idaho. 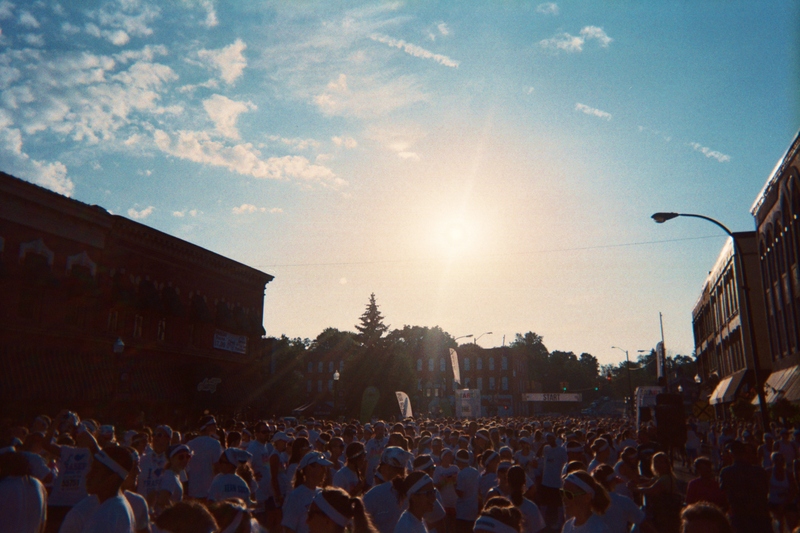 Posted in Health and Fitness, Uncategorized, Well-being and tagged excercise, gym, healing, Idaho, les mills pump, pain, running, The Color Run Ann Arbor, travel, vacation. Bookmark the permalink.